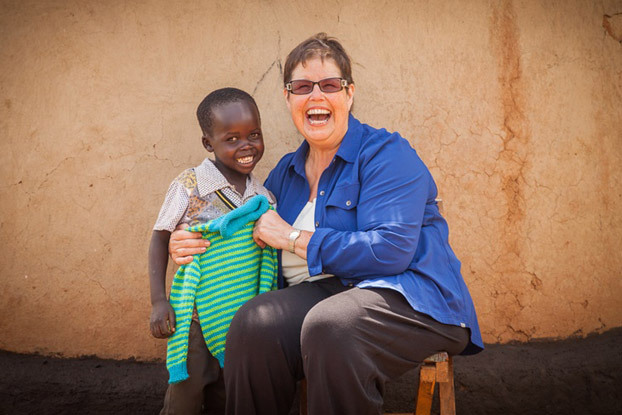 Last summer, bestselling author Debbie Macomber traveled to Kenya as the spokesperson for World Vision’s Knit for Kids program to help hand out hand-knitted gifts of love! For Debbie, knitting is more than an amazing way to help children around the world … it’s also personal. Read her story! Knitting has always played a major role in my life. I learned to knit the summer I turned 11 after pestering my mother for weeks. She knew how to crochet but wasn’t familiar with the skill of knitting. In an effort to appease me she took me to the local yarn store and asked the ladies there if they would teach me. She purchased yarn and needles for me and as they say, the rest is history. What most people don’t know is that knitting was my salvation as a child. I’m dyslexic and didn’t learn to read until I was 10 years old. I got passed from grade to grade because I was smart enough to sight read, but the concept of sounding out words and the ability to spell was beyond me. My self-esteem suffered. Knitting gave me a badly needed sense of accomplishment. Here was something I could do and do well. Because of knitting I garnered basic math and comprehension skills. No one else in my class knew how to knit so when the light shone on me it wasn’t because I couldn’t read or spell, it was for an achievement. Later, after I married, knitting helped me prepare for the births of our children and gave me an opportunity to knit for my friends and family. It became an expression of love, of sharing, and of joy. Knitting played a major role in my career as an author. I’d been published a number of years when I decided to write about friends who met and learned to knit — much as I had — in a yarn store. It was The Shop on Blossom Street that was the turning point in my hardcover career. When I first sat in that knitting shop at age 11, little did I comprehend all that knitting would mean to me and the role it would play in my future. Because of the success of that first fiction title that involved knitting, my name became well known within the growing “learn to knit” trend. It was then that World Vision contacted me and asked if I’d be willing to be the spokesperson for their Knit for Kids initiative. My husband and I had long been supporters of World Vision, and after talking it over with him I agreed. That was one of those innocent decisions one makes without fully realizing the impact a simple yes would make in our lives. Because of my involvement with other knitting charities, I knew that by nature knitters tend to be generous. World Vision teamed up with Premier Yarns and A.C. Moore stores, and soon their warehouse was filled with caps, blankets, and sweaters from talented knitters from all across the United States. Late in 2013, World Vision asked if Wayne and I would be willing to travel to Kenya to help disperse these gifts of love. We agreed and brought along our daughter, Adele, and two of our granddaughters, Bailey and Maddy. We departed Seattle with 15 suitcases, most of which were jam-packed with hand-knit sweaters, hats, and blankets knitted together by loving hands. 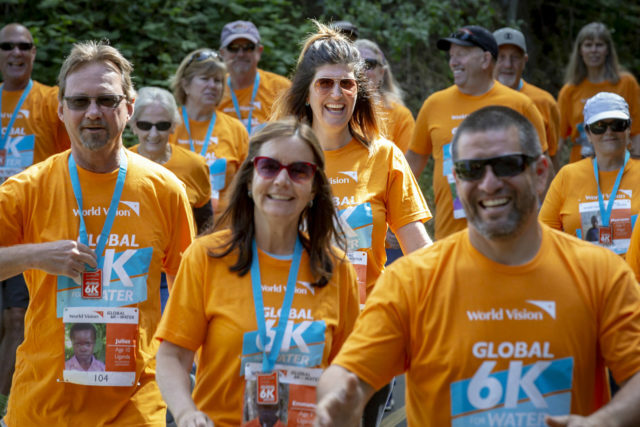 After a flight that left us cross-eyed and jet lagged, we landed in Nairobi and headed to the city of Kitale — population 50,000 — and to the site of the World Vision headquarters in Marich-Pass. It was there that I met Veronica, a young mother who stole our hearts. Veronica has seven children. Her husband had deserted the family and she was left destitute. If not for a business loan from World Vision, it is difficult to think what might have happened to Veronica and her children. We were invited to visit Veronica at her home near Kitale, which we were told was only a short hike from the road. (I have since learned the word short has an entirely different definition in Kenya.) We walked across a nearly dry riverbed and up a rock-strewn path to her home where we were greeted by Veronica and six of her children with a traditional African tea. Her home was a series of grass-thatched huts: one for cooking and the other two served as bedrooms. She told us that before she got the loan from World Vision she lived in triple darkness — dark upon dark, upon dark. It was only later as her children were able to go to school and she had the seed money to plant corn that her life became light upon light, upon light — triple light. Even now their only water supply is from that dry riverbed. The children go to the riverbed and dig until they find water. 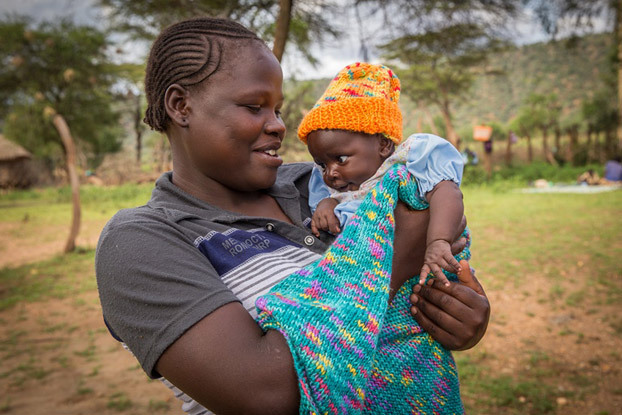 One of the highlights of our trip to Kenya was handing each one of Veronica’s children a hand-knit sweater. Their smiles of joy and excitement will always stay with me. The simple act of knitting a sweater to keep a child warm became a means of letting them know they are deeply loved and treasured. A generous knitter cared enough to send love in the form of a hand-knit sweater almost nine thousand miles across the ocean just for them. Our time with Veronica and her family was life changing and I will treasure those memories the rest of my life. I find it utterly amazing that God would use a dyslexic little girl who viewed herself as a misfit and a failure and use knitting to shape her future. And more — there’s always more with God — to reach out across the world to a young mother struggling to hold her family and her life together and wrap them both up with yarn and His love. 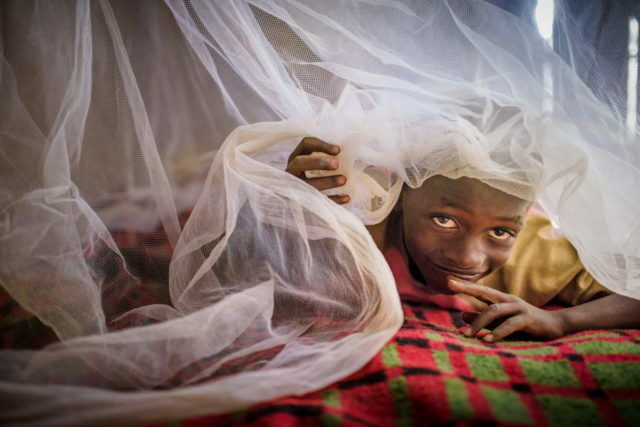 Change the life of a child and a family with Debbie and World Vision! Choose a child to sponsor today. Join Debbie and World Vision to Knit for Kids this year! Download a pattern to get started.